Habitat: The plant is native to the Mediterranean region. It grows in woods, waste and bushy areas. 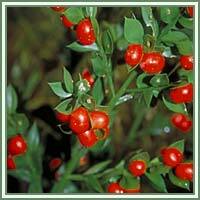 Description: Butcher's broom is a low-growing, evergreen shrub. It has a thick root and tough, striated stem with false thorny leaves. Flowers are small, greenish-white, produced in early spring. Female flowers are followed by scarlet red berries. 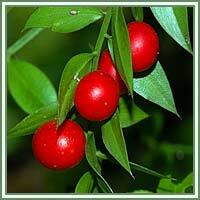 Medicinal use: Butcher’s Broom is considered to be a laxative, diuretic, and a phlebotherapeutic agent. It has been very efficient in the treatment of circulatory diseases. It improves circulation, relieves constipation and relieves water retention discomfort. Topical use of Butcher’s Broom is said to be extremely beneficial in treatments of venous disorders, such as chronic venous deficiency and varicose veins. It is also recommended in treatment of hemorrhoids. As an anti-inflammatory agent it is considered to be helpful as a remedy for atherosclerosis. In addition, Butcher's Broom has been used as a mild diuretic and laxative. Safety: Some herbs could react with certain medication. Therefore, it is advisable to consult your doctor/herbalist before consumption of any herb.